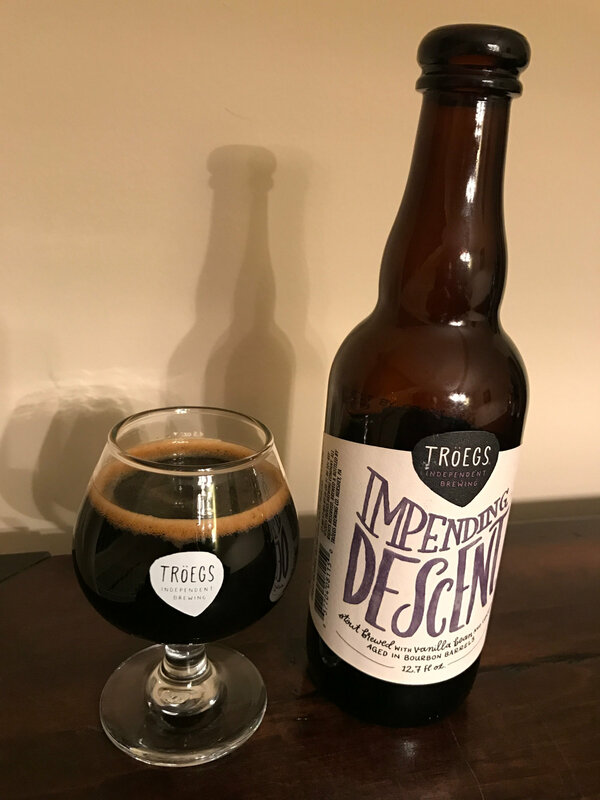 Tröegs has a series of experimental Scratch beers that are always interesting, sometimes confounding, and occasionally fantastic. Rare offerings have graduated into the standard lineup, like Flying Mouflan. Some have come and gone, and still others have made repeat appearances, but only in the limited Scratch series batches. ¿Impending Descent? was first made back in 2012 in honor of (or perhaps to spite) the (long since lapsed) Mayan apocalypse, and I absolutely loved that initial offering. Each subsequent year (on Black Friday), they've released another Scratch beer called Impending Descent, though each appears to have been a tweaked recipe. Last year's version, for instance, only clocked in at 9.3% ABV (while the original was 11.9%). Regardless, in accordance with my insatiable desire for local Bourbon Barrel Aged stouts, I've been pining after a BA version of this beer ever since that first taste. With the expansion of Tröegs' Splinter program, I've finally gotten my wish. Beer Nerd Details: 12% ABV bottled (375 ml caged and corked). Drank out of a snifter on 11/25/16. This page contains a single entry by Mark published on December 1, 2016 10:53 PM. Adventures in Brewing - Beer #17: Christmas Ale Rebrew was the previous entry in this blog. The A+ Class of 2016 is the next entry in this blog.